What is the ROUNDDOWN Function? 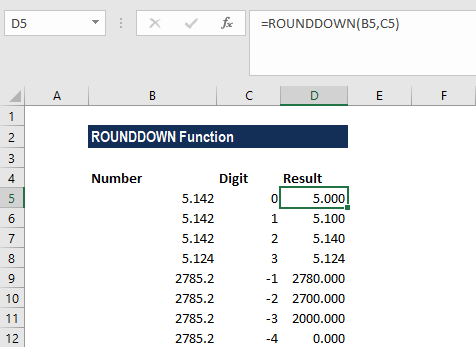 The ROUNDDOWN Function is categorized under Math and Trigonometry functionsFunctionsList of the most important Excel functions for financial analysts. This cheat sheet covers 100s of functions that are critical to know as an Excel analyst. The function will round down towards zero. Basically, it does the opposite of the ROUNDUP function. As a financial analystFinancial Analyst Job DescriptionSee a real Financial Analyst Job Description including all the skills, experience, and education required to be the successful candidate for the job. Perform financial forecasting, reporting, and operational metrics tracking, analyze financial data, create financial models, the ROUNDDOWN function is useful as it helps round a number and eliminate the least significant digits, simplifying the notation but keeping close to the original value. Number (required argument) – It is a real number that we wish to round down. A positive value that is num_digits > number, it specifies the number of digits is rounded down to the specified number of decimal places. A negative value that is num_digits < number, it specifies the number of digits is rounded down to the specified number of decimal places. The ROUNDDOWN function behaves like the ROUND function, except that it always rounds a number down. ROUNDDOWN can round either to the left or right of the decimal point. Unlike standard rounding, where numbers less than 5 are rounded down, the function always rounds numbers 1-9 down.